As is known to us all, a Gigabit Ethernet switch is always a popular choice for network users given its lower price and relatively good function. However, you may be aware of the trend that an increasing number of network users are likely to buy a power over Ethernet switch (PoE switch) in recent years. Since it has many advantages and can be used in different applications. For example, it supports power and data transmission over one Ethernet cable at the same time which dramatically simplify the cabling process and cut network cost. Then, here comes the question: how to choose a suitable power over Ethernet switch? Are there any buying tips? Next, let’s find the answers together. What Type of Power Over Ethernet Switch Should I Buy? Normally, there are three types of power over Ethernet switches, namely unmanaged PoE switch, managed PoE switch and smart PoE switch. And the managed switches are the most popular ones in actual applications. An unmanaged switch is the most basic form of a network switch. Normally, an unmanaged PoE switch only allows your devices to connect with one another. It is best suited for home and small office uses. If a business handles sensitive information such as an accounting firm or a bank, such switch is not recommended. An unmanaged switch is the most basic form of a network switch. Contrary to an unmanaged PoE switch, a managed one offers full management capabilities and security features. It can be configured and properly managed to offer a more tailored experience. It can help you monitor the network and control overall traffic. Such switch is usually used in enterprise networks and data centers. While, a smart PoE switch (or hybrid PoE switch), is a switch that has partial functions of a managed one. It enables you to configure ports and set up virtual networks, but doesn’t allow network monitoring, troubleshooting, or remote accessing. It is usually used in business applications such as VoIP and smaller networks. Port Numbers: Normally, network switches have different port numbers such as 8-port PoE switch, 24-port PoE switch, etc. The larger the network, the greater number of ports you’ll need. It is better to choose a switch that has more interfaces than you actually need. Maximum Power Supply: The maximal power supply of your PoE switch matters as well. If it is less than the overall power needed from your powered devices (IP cameras, for example), then the PoE switch won’t provide enough power for all your PoE IP cameras and the insufficient power supply may cause poor device performance like video loss. Maximum Power Consumption: You can estimate the power consumption of all your powered devices (PDs) in advance to see if your power over Ethernet switch can support. Normally, there are two types of PoE standards, namely IEEE802.3af and IEEE802.3at. IEEE802.3af could provide up to 12.95W of DC power on each PD (power loss due to network cables has been counted in) while IEEE802.3at can pump out up to 25.5W. PDs are only suitable for IEEE 802.3at PoE standard when their power draw is between 12.95-25.5W. Forwarding Rate: Switches have different processing capabilities with different rates at which they process data per second. Data forwarding rates is very important when selecting a switch. For a Gigabit PoE switch, a normal Gigabit Ethernet port attains a rate of 1Gbps. That is to say, a 48-port PoE switch operating at full wire speed generates 48Gbps of traffic. If the switch only supports a forwarding rate of 32Gbps, it can not run at full wire speed across all ports simultaneously. Technical Support: You can consider whether the power over Ethernet switch provider offers a local support team or not to support you if you have any problem in configuring the switch or other issues. From all the above, you may have a general understanding of how to choose a suitable power over Ethernet switch. You can decide which type of switch you need first, and then add additional needs such as port numbers, maximum power supply, maximum power consumption, forwarding rate, etc. to help you get the most appropriate switch you want. Power over Ethernet Switch Explained: Why Choose PoE switch over PoE Injector? This entry was posted in Network Switches and tagged 24-port PoE switch, 48-port PoE switch, 8 port poe switch, gigabit poe switch, power over Ethernet switch on January 18, 2019 by Fracy.Yin. A PoE switch (Power over Ethernet) is a network switch that carries data along with power over Ethernet network cables like Cat5 or Cat6. And Gigabit PoE switch is often found in IP camera systems in home or business networks due to its low maintenance costs, less downtime, easy installation, etc. Since there are various articles telling you how to buy PoE switch, here I just explore five parameters as a reference when buying PoE network switch. No matter buy 8-port, 16-port, 24-port PoE gigabit switch, the following five parameters are necessary to consider. Switch stacking is a common technology in network design. It offers a good solution for network designers to maximize scalability and optimize performance of networks at the same time. Therefore, when it comes to buying gigabit PoE switch, many users will take this parameter into consideration. But not all PoE switches are created equal. Most Cisco PoE switches support stacking. That’s one reason why Cisco PoE switches are more popular than others even if their price is several times higher than other similar PoE switches. However, if buying PoE switch for home or small size networks, there is no need to seek for stacking functions by spending extra money. Since PoE switches, especially 8-port, 16-port, and even 24 port PoE switch, are often used at home or office, the acoustic noise can be placed an important role when buying PoE gigabit switch. Because it’s really a bad experience if the PoE Gigabit switch near to you is buzzing all the time. Different PoE switch comes with different acoustic value. Still take Cisco 24-port PoE switch SFE2000P as an example. This 24-port PoE gigabit switch may cause 50dB noise at the maximum, which like a person speaking to you without stopping. Of course, many vendors like FS.COM and Cisco, have supplied fanless PoE switch to offer a better usage experience for users. In some applications, administrators have to deploy PoE switch up to 250m. Generally speaking, PoE switches can extend the transmission distance of data and power up to 100m via Cat5 or Cat5e network cables, which is enough for home or office applications. In this condition, a PoE repeater can deal with it perfectly. With one PoE repeater, the transmission distance can be added to 100 meters. In the PoE gigabit switch market, there are two types power supplies: a single power and dual power. Usually dual power is designed for power redundancy. When one of the DC power inputs has failed, the other will be triggered and working for the switch. Does it mean dual power is necessary for PoE network switch? May not be. Considering the power redundancy, most vendors have strengthened their switch power supply, which can support the switch working for years. And some switches like Cisco catalyst 3850 series PoE switches offer dual power supplies, but it requires extra order to get it working. This factor is often considered by those who have or work in data centers or service room where have numbers of network switches. Generally there are three types of airflow of network switch: back-to-front, front-to-back and side-to-side. 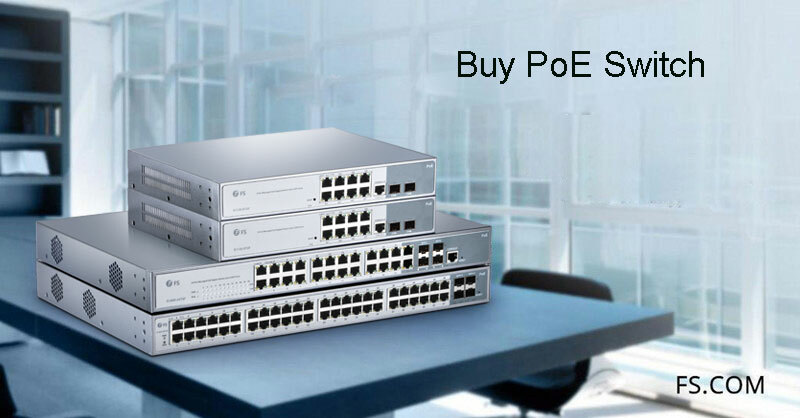 Keep in mind to consider this factors when buying PoE switch, especially buy 48-port PoE gigabit switches that are often used for enterprise networks. There are examples in tech forum that some users ignore the airflow direction of the network switch, which causes the switch fans drawing air from its hot air exhaust. So where to buy PoE switch is not an easy decision. Both the switch price and functions are needed to be taken into consideration. FS.COM offers PoE managed switches with different ports like 8-port, 24-port and 48-port. All of them are compatible with IEEE802.3af/at. And professional buying advice is also provided if need. Welcome to visit www.fs.com for more details. Related article: PoE Switch VS. PoE+ Switch, Which Will You Choose? This entry was posted in Network Switches and tagged 24-port PoE switch, buy poe switch, PoE gigabit switch, PoE network switch, PoE switch on January 19, 2018 by Chloe Wang.